The archbishop of Vienna’s words are highly significant, since he is considered an authority in such matters. He is one of the theological heavyweights in the College of Cardinals, was chief editor of the Catechism of the Catholic Church, is very close to Benedict XVI and played an important role in the 2014 and 2015 synod of bishops. For all these reasons, Francis chose him, and not Cardinal Gerhard Müller, the Prefect of the Congregation for the Doctrine of the Faith, to present his post-synodal exhortation on the family to the international media. Earlier, the Dominican cardinal said he took personal joy in the fact that “Amoris Laetitia,” written by a Jesuit pope, “is profoundly Thomistic.” In actual fact St. Thomas Aquinas is cited 19 times in the text, according to Cardinal Lorenzo Baldisseri, the secretary general of the synod of bishops, who was also on the panel presenting the text, together with an Italian married couple, Professors Francesco Miano and Giuseppina De Simone. The great question, obviously, is this: How do we form consciences? How do we arrive at what is the key concept of this great document, the key to correctly understanding Pope Francis’ intentions: ‘personal discernment,’ especially in difficult and complex situations? Asked by a reporter what happens if a bishop is unable to make a discernment, Cardinal Schönbornexplained that “discernment by its nature involves some uncertainty; the principles are clear but, as St. Thomas Aquinas said, the deeper we go the more difficult it is to discern.” He predicted that bishops and priests will have a lot of work to do as a result of this papal exhortation. Aquinas was a doctor of the church. There is no orthodoxy test when we look at the contributions of doctors of the church. We take the good they gave us and we do not dwell on the disagreements. That's what building a tradition is. Catholics are not automatons and just because a particular Saint may be declared a Doctor of the Church because of a particular important contribution on a particular area of the Faith, this does not mean that any non dogmatic comment they may have made over the course of their Lifetime is "Tradition", the equivalent of holy writ. Things don't work that way in yhe Catholic Church. All Innovations must be discerned, Scripture insists, nay demands Discernment. Furthermore, keep in mind that What is being discussed today, was not contemplated in non dogmatic statements made by St Thomas Aquinas (7 Centuries ago) about Conscience. Discernment is the authentic Tradition. Be careful when people try to use non-dogmatic quotes from Saints. Issues like these demand subtle reasoning undertaken away from the pressue cooker of a snap Synod with commentary largely sourced from the New York Times. Let us be prudent and lets take all the time needed to ensure that important subject such as Conscience is studied and discerned. Just in my opinion.. in Christ,. Please stop. YOUR original objection was about how orthodox or not Aquinas is, not about all this other stuff. And are you "warning" me about something in a Papal Exhortation? Who are you to warn anyone about that? The Pope's speaking, which he has all the authority to do, and I am listening, as all loyal Catholics should be. if that ain't you, then you need to stake stock. You know, William, your habit of saying that someone with whom you don't agree "may not be a co-religionist" is getting old, very very old. It's a passive agressive ploy to cover the fact that you have trouble with Catholics who don't make all of the same judgments as you do. The Catholics with whom you disagree are, in fact,. "real",honest to goodness Catholics, often very well educated in Catholic teachings, perhaps more well educated than you are (such as the Jesuits and theologians with whom you disagree as well as many of the laity who comment here), who are also every bit as "faithful" Catholics as you are. From the very beginning, Jesus' followers have disagreed about some things and that continue to this day and will continue during the rest of human history, assuming the Catholic church survives until the end. It's well past time to drop that particular ploy, along with the false humility of being just a simple, working class man. You apologize for being "forthright" so I will be equally forthright with you The "co-religionist" ploy is not only past it's sell-by date, it's borderline offensive, which has been pointed out before. It's fascinating that you are justifying closing your mind to Francis, though, and even to Aquinas, the man responsible for a number of questionable teachings. I'm with you there, but I suspect we would not agree on whcih ideas of Aquinas were wrong, or questionable. But I admit it's fun to see the "obedience is all" crowd join the rest of us in the cafeteria, claiming that "it's not infallible" teaching. Well, maybe not. Very little of Catholic teaching is "infallbile", including the teachings that are among the "hot-button" issues of today. Falling back on the concepts of development of doctrine and hierarchy of truths usually help the men in charge save face when they change a teaching that they had once claimed could not be changed. The cafeteria is the only place intelligent, educated Catholics belong, really, , so welcome to the cafeteria. At least we finally agree on something - we are not automatons. Exactly - which is the reason the church has always upheld primacy of individual conscience, even when it goes against whatever Rome might be teaching at any given moment of history. Great document which gets to the Spirit of the Gospel. So important is the reference to the Samaritan Woman at the Well. This is a story that dogmatists shun like the plague. They cannot handle it. Yet Jesus not only engages it He asks her for a drink. Jews weren't supposed to speak to Samaritans. Men weren't permitted to address women without their husbands present. And rabbis had no business speaking to women such as this one. Jesus was willing to toss out the rules, but our woman at the well wasn't. "You are a Jew and I am a Samaritan woman," she reminded him. "How can you ask me for a drink?" (John 4:9). So Jesus asks her for a drink. What an inversion! Mercy reaching out to the oppressed. The fountain of life offering life to one who is seeking life. It is a profound story and lesson. Its day has come. 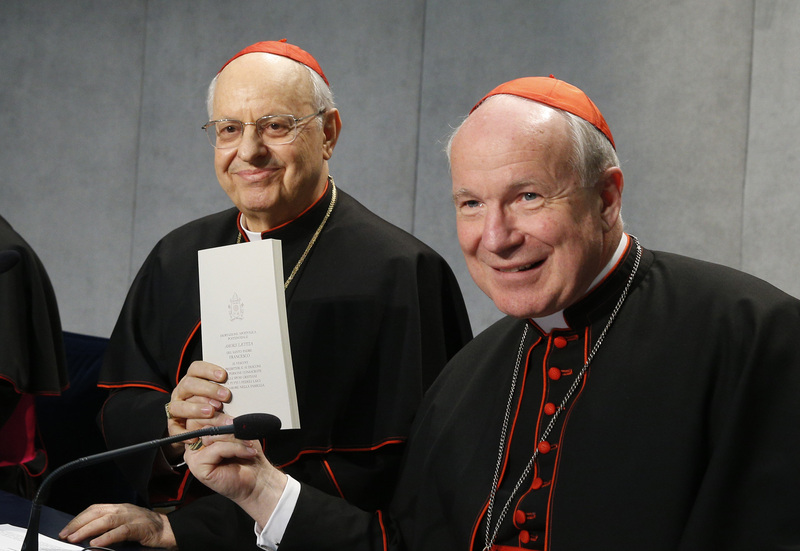 I would like Cardinal Schonborn to explain why any Catholic should give any more deference to Amoris Laetitia than Cardinal Kasper gave to Familiaris Consortio. How does one write "Ouch!" in German? Cardinal Newman made clear that the development of doctrine could never involve its negation. The Church's perennial teaching on communion for those who divorce and remarry, grounded in the clear and unambiguous words of Jesus Christ, cannot be changed by an ambiguous footnote.